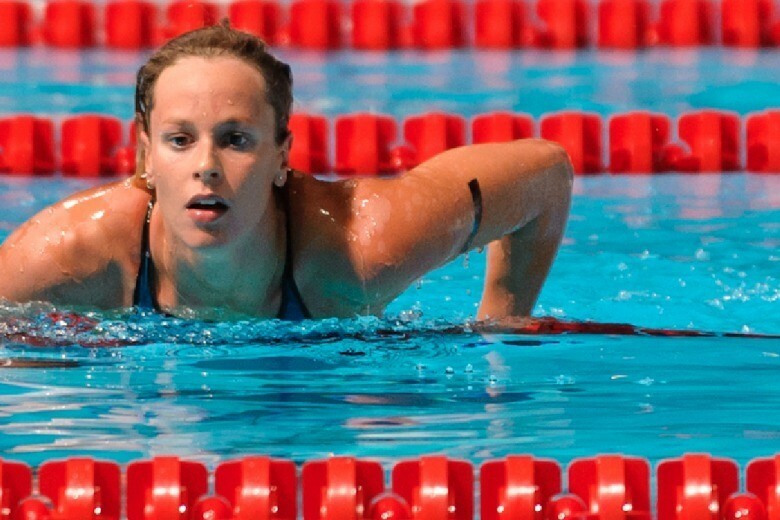 Sweden’s Sarah Sjostrom earned top seeds in both the 100m butterfly and 50m freestyle events after the first session of prelims at the 2015 Sette Colli Trophy in Rome, Italy. 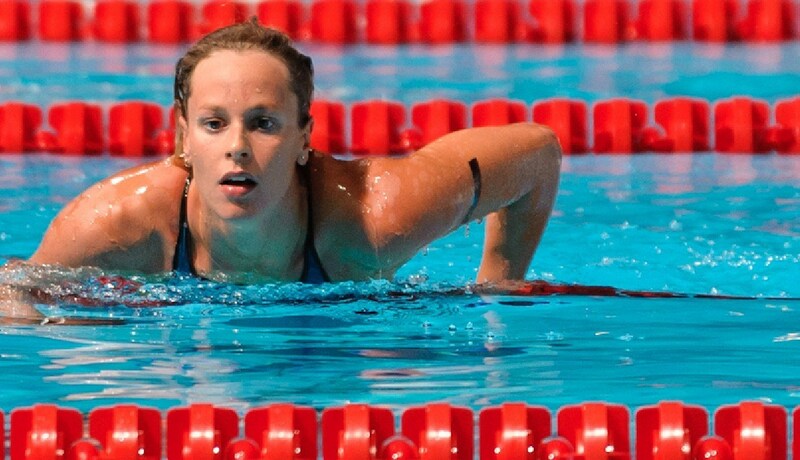 The last prelims session of the 2015 Sette Colli Trophy has set up some terrific battles for tonight’s finals, led by Swedish powerhouse Sarah Sjostrom and France’s swiftest sprint weapon, Florent Manaudou. With her morning swims, Sjostrom positioned herself as the number one and two seed in her races for tonight. First, her 25.70 was a solid effort to clock the top time in the women’s 50m butterfly, but the battle will not be easy for this red-hot swimmer. Sjostrom will be chased by teammate Therese Alshammar, who produced a 26.38 for third behind the 2014 Sette Colli meet record holder Inge Dekker (NED), who registered a 25.72 for the 2nd seed this morning. That time matches Dekker’s best of the season, which she recorded in Mare Nostrum – Barcelona just days ago. Ranomi Kromowidjojo (NED) will also be in the mix, touching in 26.59 for the 4th seed for tonight’s showdown. Sjostrom will also appear in women’s 200m freestyle final, earning the 2nd seed (1:58.71) behind home crowd favorite Federica Pellegrini. Pellegrini narrowly led the field, touching in first by just .14 of a second ahead of Sjostrom to claim a time of 1:58.57. Two additional proven competitors will be ready to move up the ranks, however, as Kromowidjojo’s 1:59.80 and France’s Coralie Balmy’s 2:00.39 earned them spots in the final. Balmy has already won the women’s 400m freestyle from night 1 of this competition. The men’s 100m freestyle sprint spectacle saw France claim the top two seeds of the morning. Mehdy Metella clocked the fastest time of the morning, 49.05. Metella currently holds the 10th-swiftest time in the world with the 48.44 he earned at the Golden Tour in Nancy last month. But, the field is stacked for tonight, with Metella’s fierce teammate Manaudou no doubt looking to carry over his 50m freestyle winning streak over to the 100m distance. This is the first time Manaudou has competed in the 100m freestyle thus far this year, so all eyes will be on how this splash n’ dash specialist adapts to the longer distance as a means to perhaps gauge the potency of France’s 4×100 freestyle relay. For his part this morning, Manaudou swam a smooth 49.64 for 2nd seed, but look for a time drop in the evening session. Manaudou’s personal best is the 47.98 he raced last year in Berlin. On the opposite end of the distance spectrum, the women’s 800m freestyle and men’s 1500m freestyle finals will also be contested tonight. Look for Italy’s Gregorio Paltrinieri to perhaps try to top his already number one world ranked time of 14:43.87 in the event, which he nabbed at his country’s spring championships. Finals start at 6pm local time/Noon Eastern time. I didn’t realize that Therese Alshammar was still in action at 37. Sjöström’s 50 fly should be interesting. Very interesting men’s 100 free too with Manaudou (perhaps his only 100 free race of the year in individual), Orsi, Verschuren, Dotto and Metella who is better and better in that event. Can Pellegrini push a little Sjöström in the 200 free? I doubt. Day 3 finals. Notable results. Govorov wins the men’s 50 fly in 23.44. Metella only 6th in 24.27. Sjöström wins the women’s 50 fly in 25.23. Young Turkish Gunes wins the women’s 200 breast in 2.24.18. Metella wins the 100 free in a great way in 48.60 (23.80/24.80). While his fly looks not great in the past few weeks, at the opposite his freestye really looks better and better. Sjöström wins the 200 free in a very decent 1.55.05. Very decent time too for Pellegrini second in 1.56.06. Paltrinieri wins the men’s 1500 free in 15.00.60. Frenchman Damien Joly good second in 15.03 close to his PB of 15.02. In Monaco Chad le Clos wins the men’s 100 fly in 51.66. Lochte 2nd in 52.64. AVW wins the women’s 100 free in 53.97. Bonnet 2nd in 54.12. Seto wins the men’s 400 IM in 4.10. Biedermann wins the men’s 200 free in 1.46.72. Lochte 3rd in 1.49.17. Watanabe just ahead of Hosszu in the women’s 200 IM. 2.09.95 vs 2.09.97! Mie Nielsen easy 100 back winner in 59.51 ahead of Coventry and Baker. Irie with a common 1.55 in the 200 back. Hosszu wins the 400 freestyle in 4.08.